Last night at the Oscars, there sure was a lot of excitement for many of my friends and colleagues, and I'm not just talking about the surprise ending with La La Land winning Best Picture, then losing it in a tragic mistake of envelopes, to another well-deserving film Moonlight. That is because many of my friends and colleagues are strong advocates and wonderful clinicians who are vocal about excellent care at the end of life. The film Extremis, which was released in April 2016 at the Tribeca Film Festival, was nominated for An Academy Award for Best Documentary Short Subject, but up against top competition did not end up taking home the Oscar. The winner last night was a film about the Syrian Civil Defense volunteer rescue workers called The White Helmets. 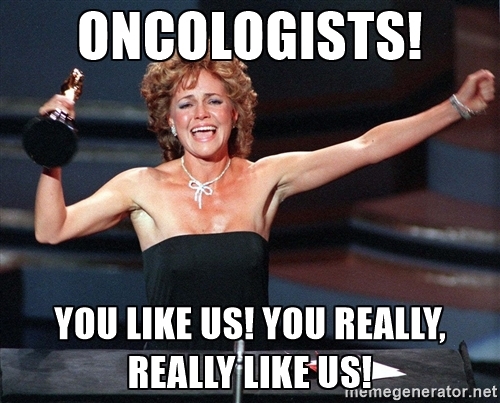 The nomination for Extremis should really be considered a win, because now many more people are aware of it, and palliative care providers can use it as a discussion tool. 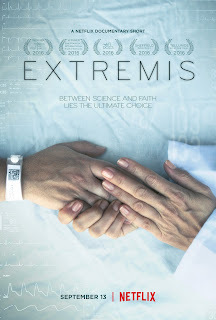 Extremis offers a glimpse into the hectic and fragmented world of the Intensive Care Unit and the decisions doctors, patients and families make when the chances of survival reach the limits. The clinician who we follow is Dr. Jessica Zitter, a Critical Care Specialist and board-certified palliative care physician. 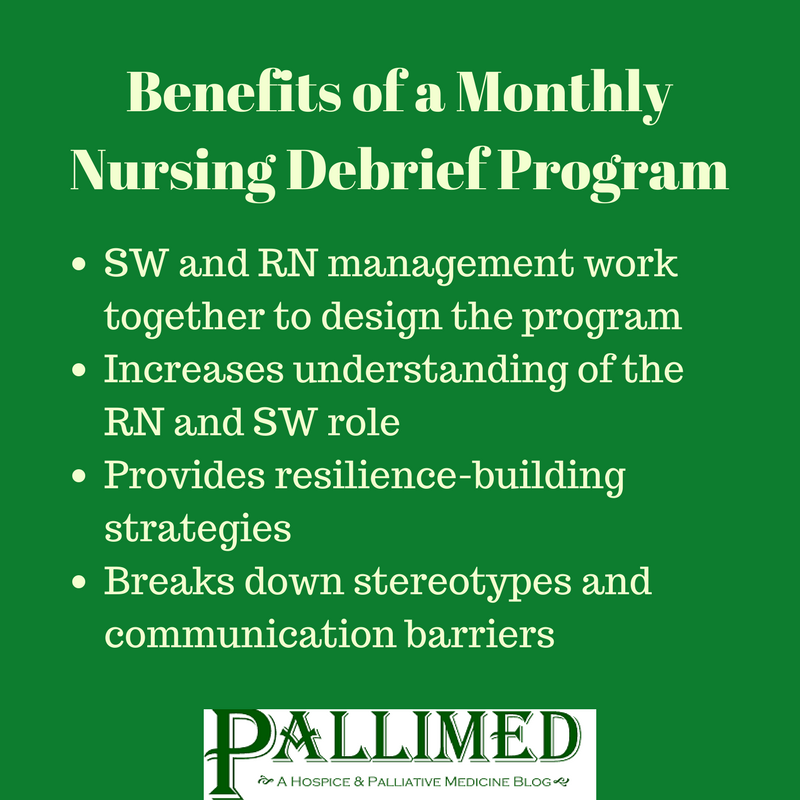 We see glimpses of her conversations with a diverse group of patients and families, never lingering on one discussion too long. 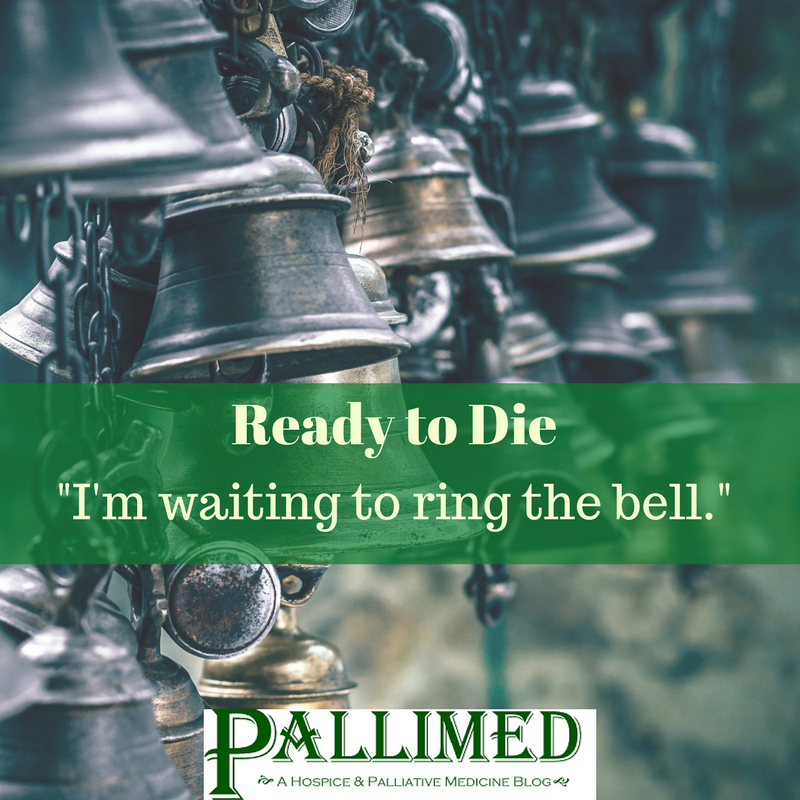 Many phrases will feel familiar to palliative care and ICU staff as hope, miracles, uncertainty, and staying positive all struggle to push back against the overwhelming weight of illness. Initially, I found myself being a little too critical of some conversations. "I would never say that," I would think to myself, until I recognized that I have said those things, but they were in the a certain context. Director Dan Krauss, doesn't always give you the context of the conversation that we often get when we work at the bedside each day. When trust is built you can broach the most difficult topics. I found it interesting the filmmaking team decided not to highlight the buildup of trust and relationships, yet there is a reason for that. 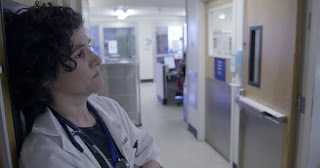 The real focus of this film is not Dr. Zitter, it is the people experiencing the illness, the patient and their family. It takes a while, maybe even after you are done watching it, to recognize that the small windows into how people think and fell their way through a critical illness and possibly dying, is the important take away here. I'll be very interested to see how palliative care and hospice teams use this film to spur discussions within their own team or organization, or to engage the community to think about these issues before they find themselves in Extremis. You can catch Extremis now on Netflix. Christian Sinclair, MD, FAAHPM, is the Editor of Pallimed, and amateur film buff who once got to meet Dr. Zitter and the producer Dr. Shoshana Ungerleider at a conference and forgot to ask to take a selfie with both of them. 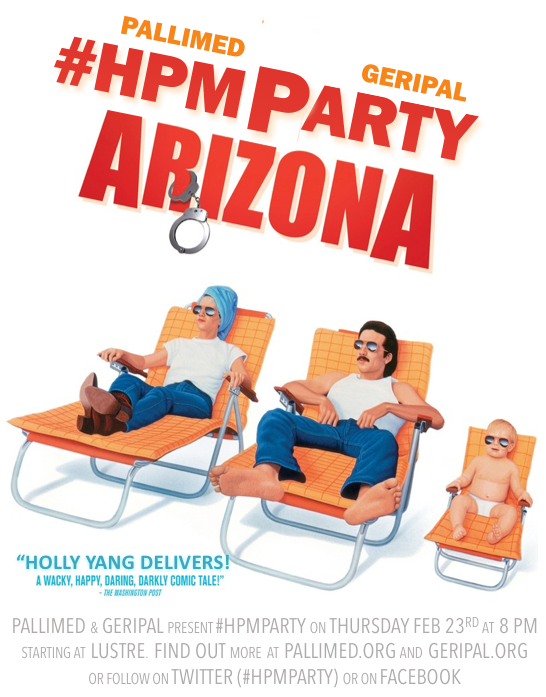 The Annual Assembly of AAHPM and HPNA is right around the corner and if you are going to Phoenix, or staying home to keep things running smoothly, social media can help make your conference experience be transformative. Since 2009, the Assembly has been making use of Twitter to provide additional insight, commentary and sources for the multiple sessions each day. Now things are expanding to dedicated conference apps, Facebook and Instagram. And for the first year ever we have Twitter contests. 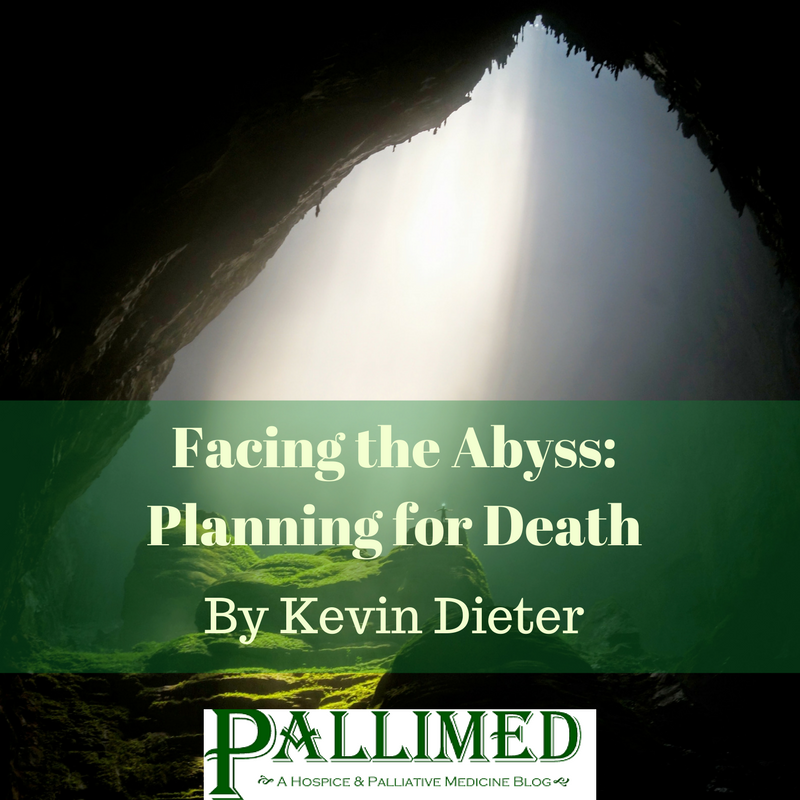 A phrase in Dr. Dieter’s recent Pallimed piece, "Facing the Abyss: Planning for Death," usefully resurfaced a notion I’ve had for 12 years now. 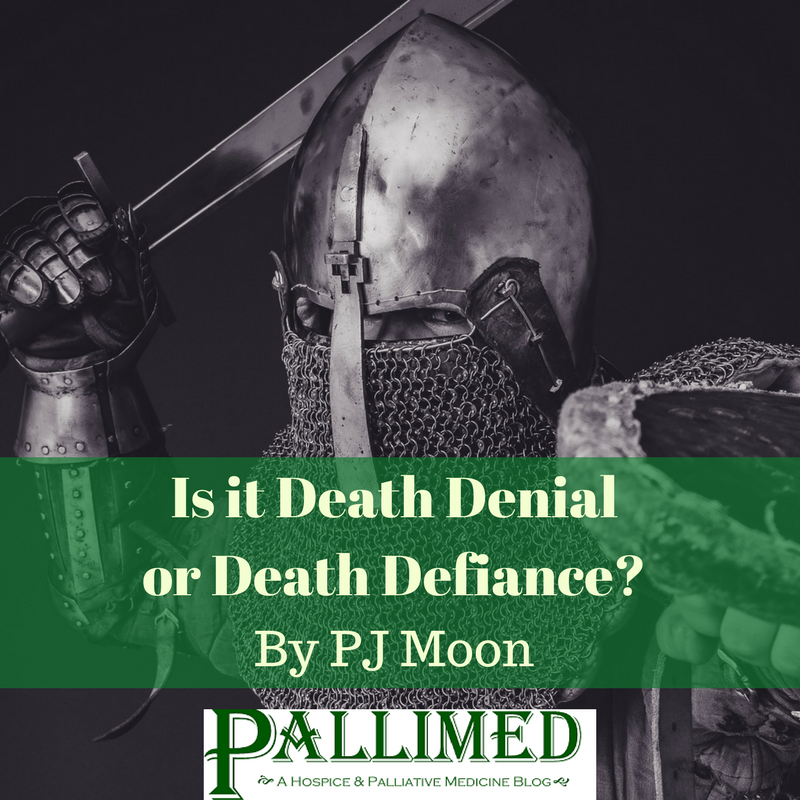 It started when a professor I was working under remarked how the "death denial thesis" may not really be valid anymore in geriatric/end of life publications and discourse. Combing through the literature, my professor’s hunch rang true, but only faintly so. To be clear, it wasn’t that issues of human mortality were given special spotlight by journal editors and varying authors, but rather the matter was generally portrayed in ways that did not neatly fit the category of denial, cloaking, or marginalization. Instead of the so-called death denial thesis being eliminated, I perceived another thematic rhetoric rising. 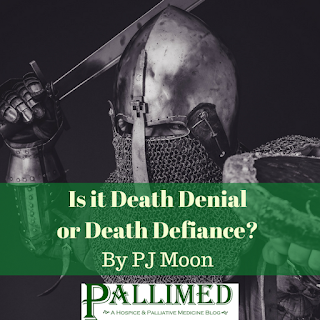 Given the commerce of innovation in medicine and cognate arenas, emerging tools have enabled us to ‘manage’ death, hence rendering death-denial less marketable. I call this the death-management thesis. Before we get carried away, a distinction is made between Hippocratic and Baconian paradigms.1The former is a view that human nature is to be "worked with" out of inherent respect. The latter is a view that human nature is a thing to be figured out towards overcoming and controlling it, to have victory over it, according to our will and whim. So, which appeals to you, dear reader: the Hippocratic or Baconian enterprise? Whether death-denial, -management or –defiance, mortality rate for the human race is still running on full steam at 100%. Given this persisting fact, it is to our loss when death is denied. You see, when you and I deny death, we lose track of our constituent nature, or our inherent mortal state. When death is denied then we actually give death the upper hand. 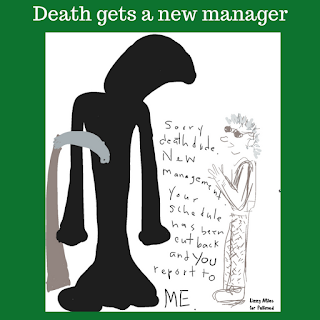 It just may be that death wants mortals to vigorously exercise the skill of denying its reality so it can eventually strike with greater insult and offense. (b) please rethink if it’s death that’s being managed or merely its common forerunners of certain kinds of pain, angst, slumber, etc. (c) please take caution in defying death because wisdom tends to be about facing reality (including seeing through illusions)2 and not turning away from it. In sum, I find it more worthwhile to live in light of intractable death by actively preparing for it in various ways today, tomorrow, and the next day, and thereafter until it comes. 1. Jecker, N. S. (1991). Knowing when to stop: The limits of medicine. Hastings Center Report 21,(3), 5-8. 2. McKee, P., & Barber, C. (1999). On defining wisdom. The International Journal of Aging and Human Development, 49(2), 149-164. Paul J. Moon, PhD, is Bereavement Coordinator at Alacare Home Health & Hospice in Birmingham, Alabama, USA. Even apart from his professional role, he ponders much on his mortality, the afterlife, and how best to get ready. He cares to plead for you to consider doing likewise. With all that is me. for preserving my dignity, for all of eternity. This team wellness activity is brought to you by The NorthEast Palliative Care Team (aka NorthEast Palliators), who are part of Carolinas Palliative Care and Hospice Group and Carolinas HealthCare System NorthEast in Concord, NC. 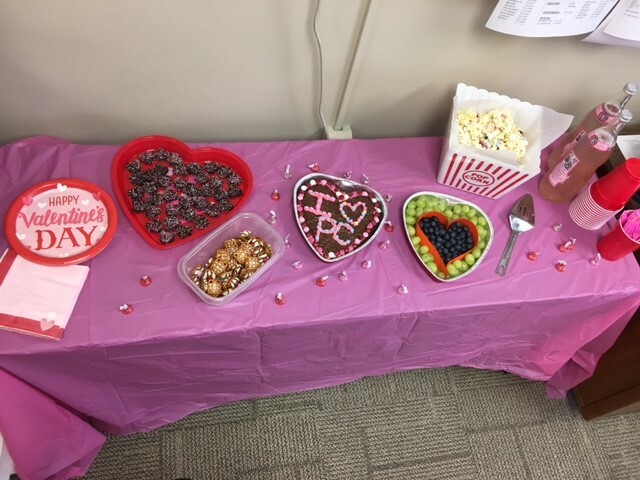 Fun, creativity, and laughter are high priorities to their Team Wellness Plan. 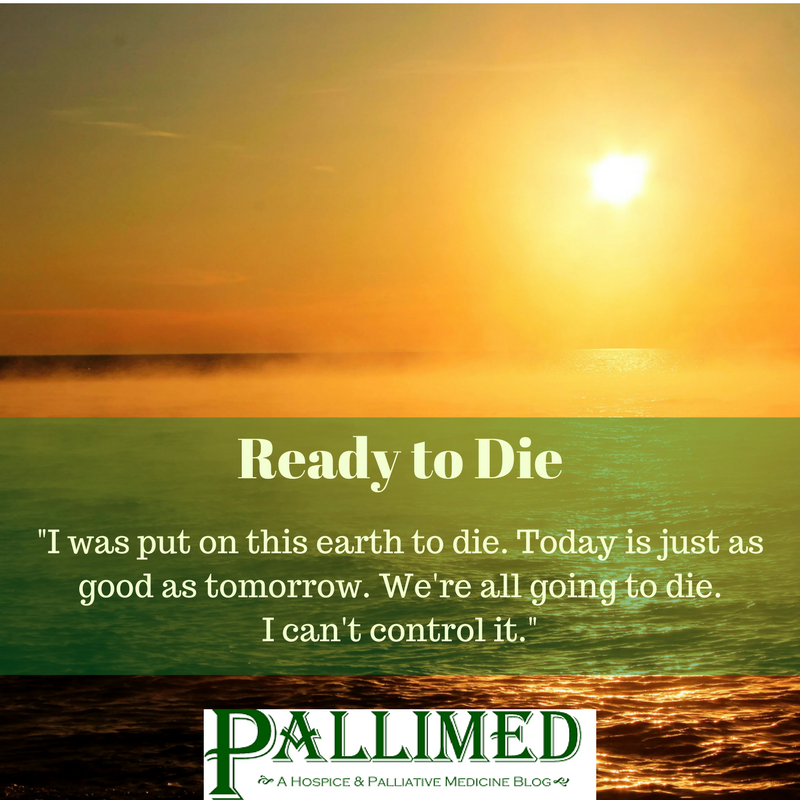 These are statements made by hospice patient to me over the years indicating their readiness to die. I recognized there was a beauty in the variety of ways the patients chose to express their wishes. "If something is going to happen, let it happen. Life is getting less interesting as the days go by." "Sometimes I wonder why they've all gone and I'm still here." "When I go to bed I always wonder if this will be the time I die." "I've done it all I've seen it all. I could step out." "I'm ready to get up and jump around"
"I'm 93 and anything can happen at any time. I have no qualms." "I was put on this earth to die. Today is just as good as tomorrow. We're all going to die. I can't control it." "Right now heavenly home is home. They tell me we'll see our loved ones and never have to say goodbye. That would be wonderful." "I'm waiting to ring the bell." "I know we're not going to be here forever. Hereafter is another home. It ain't no temporary home. It's permanent and there are no utility bills. No taxes." "My goal is to wonder how I fill the days until my days are gone." "I think it would be nice if every single person in the world had a button to push to say, 'okay I'm ready'." Lizzy Miles, MA, MSW, LSW is a hospice social worker in Columbus, Ohio and regular contributor to Pallimed.org. 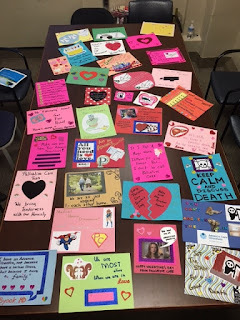 Lizzy authored a book of happy hospice stories: Somewhere In Between: The Hokey Pokey, Chocolate Cake and the Shared Death Experience. Lizzy currently has a Kickstarter campaign with life advice from hospice patients. Lizzy is best known for bringing the Death Cafe concept to the United States. You can find her on Twitter @LizzyMiles_MSW. The American Society of Clinical Oncology recently published the strongest call for concurrent palliative care in oncology. Released online on Halloween 2016, and published in the Journal of Clinical Oncology just last month, this Clinical Practice Guideline (CPG) should be in the pocket of every palliative care team as they meet with their oncology colleagues to collaborate on better care for patients. So what changed between 2012 and 2016? Will this new guideline change practice? History may give you a reason to be cynical. Palliative care has been trying to get upstream with oncology for a LONG time. Surprisingly, the 2012 Provision Clinical Opinion and Temel study had no impact on the 2013 NCCN Guidelines for lung cancer (0 mentions of palliative care in 100 pages). But with studies like Al-Jawhari's Palliative Care in Stem Cell Transplantation and the growth of the Palliative Oncology conference, things may be changing. In addition, value-based payment models like the Oncology Care Model emphasize QOL. 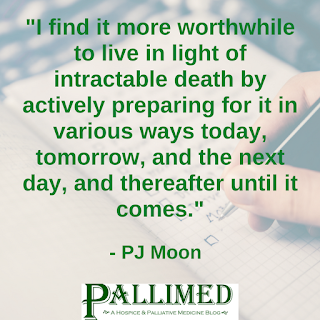 Check out more Pallimed posts about oncology. This week, I was able to present these guidelines at the Cancer Center Business Summit in a session dedicated to palliative care. The audience was primarily administrators and executives of community cancer centers wanting to talk about how to make palliative care more integrated into their care delivery, so I am hopeful there is a plowed field ready to plant some seeds of concurrent palliative care. So go download this open access PDF, read it, make sure you are doing the best evidence palliative care you can do, discuss it with your palliative care colleagues and only THEN when you have your ducks in a row, go talk with your oncology peers and see what beautiful things you can create together. Christian Sinclair, MD, FAAHPM is a palliative care doctor at the University of Kansas, editor of Pallimed, and really loves doing outpatient care in the oncology clinic. Puzzlingly, the older and more “seasoned” I become, the more this bit of Amish wisdom is true. Especially when it comes to reading. I don’t have time to read. So, I was surprised when I found myself reading a recent publication from the National Quality Forum. However, as serendipity would have it, I am so glad I did. This publication, “Strategies for Change: A Collaborative Journey to Transform Advanced Illness Care“ had me hooked with the introduction. They had the beautiful audacity to suggest that physicians can and do have the ability to engage in conversation about the taboo (their term) subjects of death and mortality. As I read further, I was rewarded with a section devoted to “peaceful death and dying." There has been debate about whether we truly live in a death denying culture. I believe that we do. Strongly so. Ernest Becker, in his Pulitzer prize winning book The Denial of Death, makes a compelling case that western societies are THE most death-denying in all of history. I see the results of this everyday. Our mortality, the inevitable finality of this life, is routinely disregarded as an essential contribution to the plan of care. The result is a series of squandered opportunities for healing and even transformation at the end of life. Very sick patients are referred to hospice without a prior discussion of goals of care and resuscitation status. Very sick patients travel from hospital to hospice house, often dying on route. But even more common is a never-ending procession of the dying patients and their loved ones who come to the end of life totally unprepared. The poet W.H. Auden described death as “the rumble of distant thunder at a picnic.” It’s a brilliant metaphor. In my mind, in that scenario, we have 3 choices. The first choice is to totally ignore the thunder and hope that the storm blows north, but when the storm does hit, we will be totally unprepared and will be in some danger. 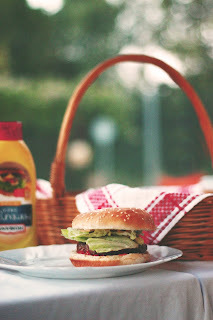 The second choice is to recognize that the storm is coming, and to feel dread that it will totally ruin the remainder of the picnic, and yet do nothing to prepare for it. 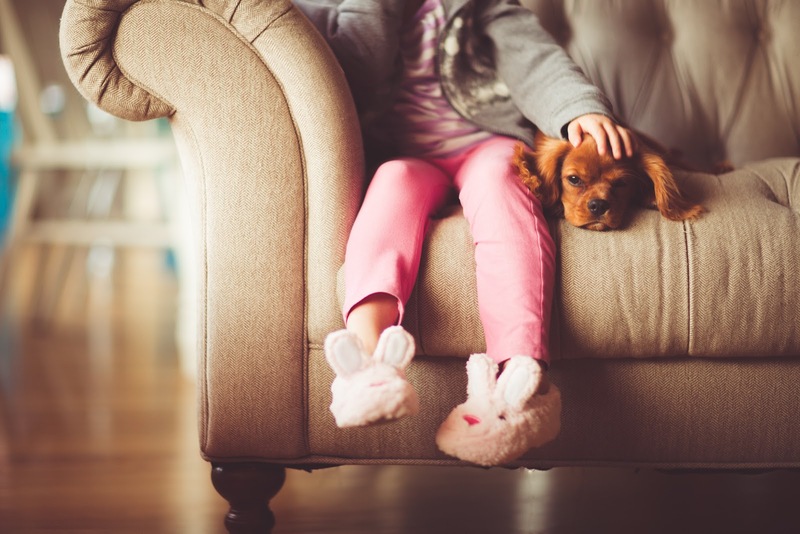 The third option is to recognize the threat that the thunder represents, to reorganize priorities and enjoy the good weather while you can, and then be packed and ready to seek shelter when the storm hits. I believe these metaphorical choices are similar to our society's attitude toward death. Most of us choose the first 2 options in regards to our own mortality. The medicalization of death and dying, increasingly prevalent following World War II, has placed physicians in a difficult situation. Advancements in medical technology, the rise of consumerism, and the strengthening voice of patient autonomy have encouraged society to give us the responsibility of managing death, but for the most part we are poorly trained and generally not inclined to do so. We have, however, made significant progress in helping patients and their families negotiate the myriad of decisions and break points they encounter as their health fails and they traverse the healthcare system. This progress, through many variations of advance directives, follows the thread of “quality of life." 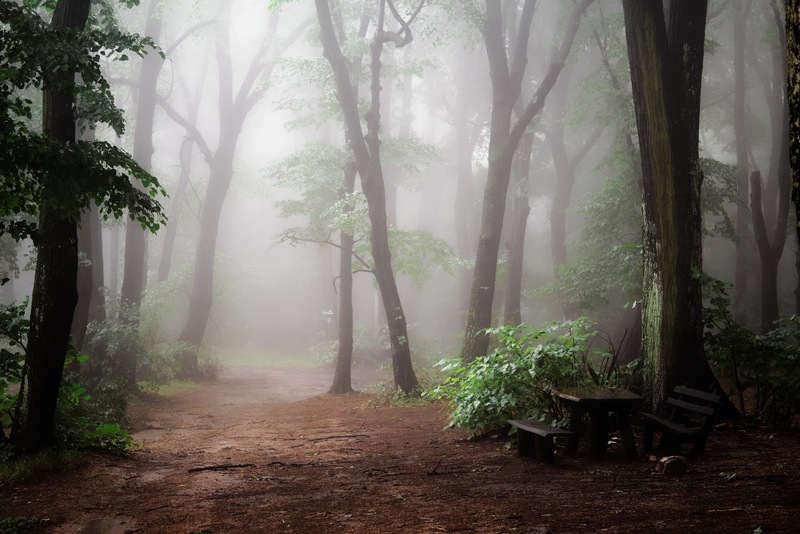 I picture the patient as Indiana Jones, running through the jungle, dodging spears and traps, tumbling and rolling, and finally seeing the clearing in the trees. With the screen focused squarely on their face, I see the expression go from anticipation and relief to dread as they look down into the 10,000 foot abyss. 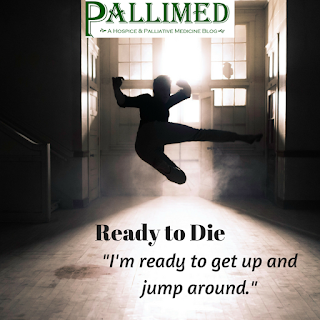 Advanced Directives and Goals of Care discussions may get them through the jungle, but when it comes time to die, they are horribly unprepared. Very little time, they realize, was spent considering the quality of their death. It is time to die, and they haven’t imagined themselves on this death bed. Dying patients and their loved ones today enter a space totally unfamiliar. One hundred years ago, most Americans grew up in household where death occurred and dying was more accepted as a part of daily life. Today, many of us live on the surface of life, existing from Tweet to Tweet. Richard Groves calls this “the demon of busyness.” Our attention span has been measured in seconds. 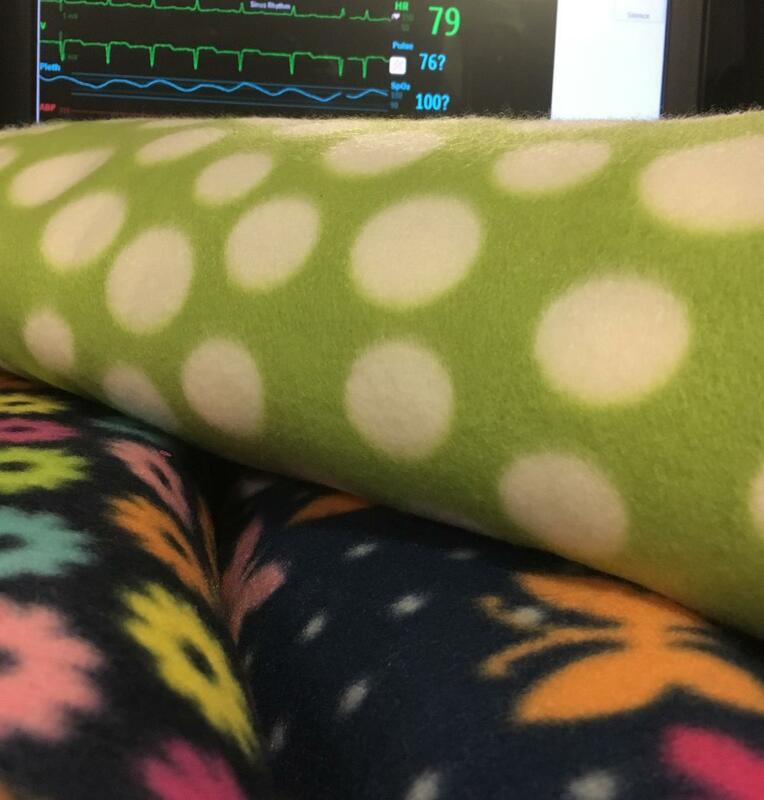 Dying, and being with the dying, often requires sitting with uncertainty for long periods of time. We are very uncomfortable being there. It often does not sound, look or smell nice. 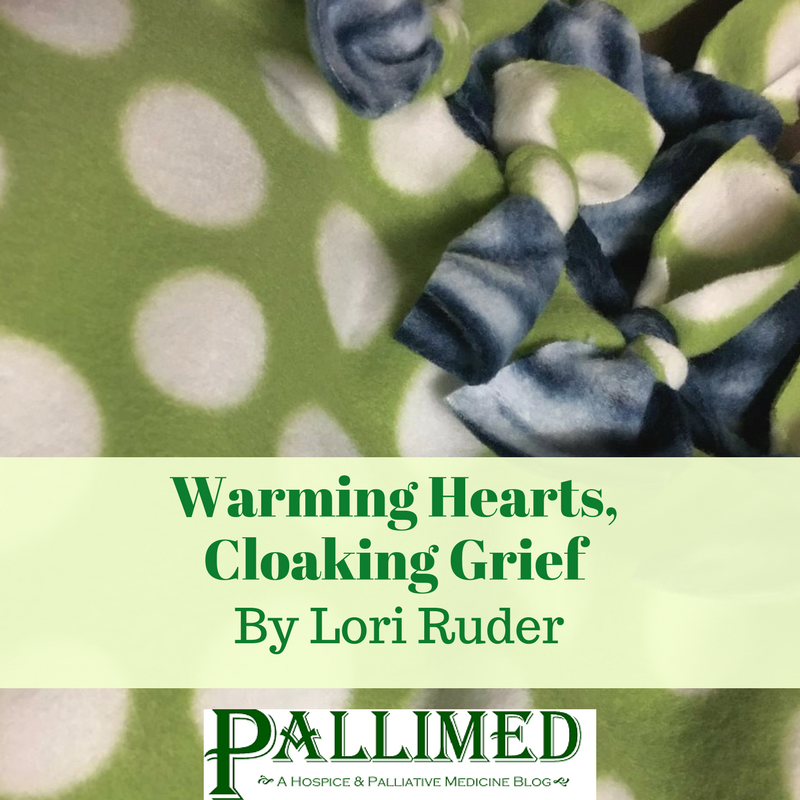 Dying is the ultimate time of transition for those involved in the loving and caring for the dying. 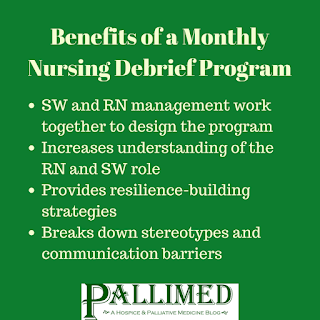 Without experience, and with difficulty accepting uncertainty, many patients and families come to the dying time unaware of what to expect, and worse, how to prepare. We need to work much harder at preparing our patients for end-of-life. This is not our responsibility alone, however. There seems to be a grassroots movement developing that encourages open discussion about death and dying. Social media is exploding with new and increasingly innovative ways to initiate and encourage this dialogue. The demon of busyness is being met head on by card games, like “GoWish”, and interactive art such as the “Before I Die “ walls. These social instruments allow our society to begin the uneasy discussion about what has been taboo. In medieval times, the practice of “ memento mori,” a constant gentle reminder of their own mortality, served the purpose of improving the quality of their life, But it also improved the quality of their death. They heard the thunder, they prepared for it, and they enjoyed the picnic. We can, and should, be part of the discussion. We should initiate it and foster it. Consider hosting a Death Cafe or buy and distribute GoWish card games. Volunteer at a local hospice doing bedside vigils, and write about what you learn. We can become more comfortable in talking about quality of death. 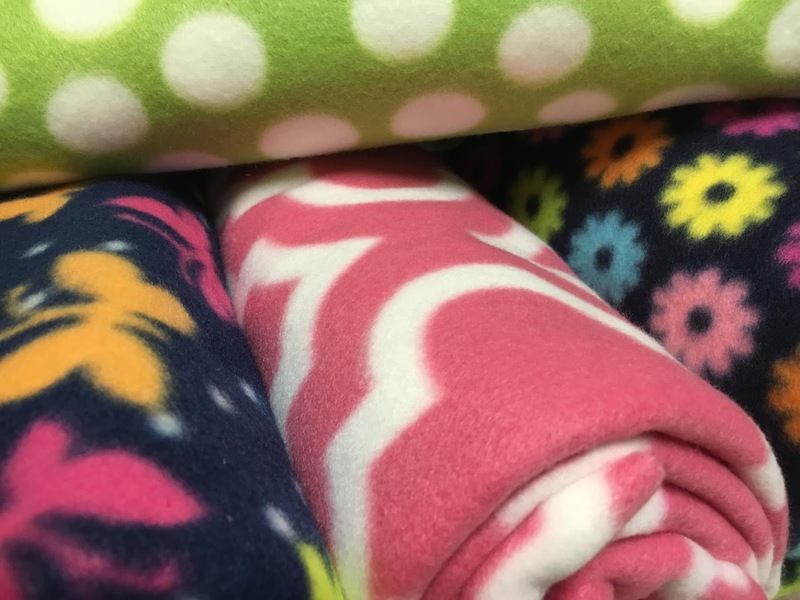 We can improve the quality of our patients lives by helping them consider the quality of their dying. 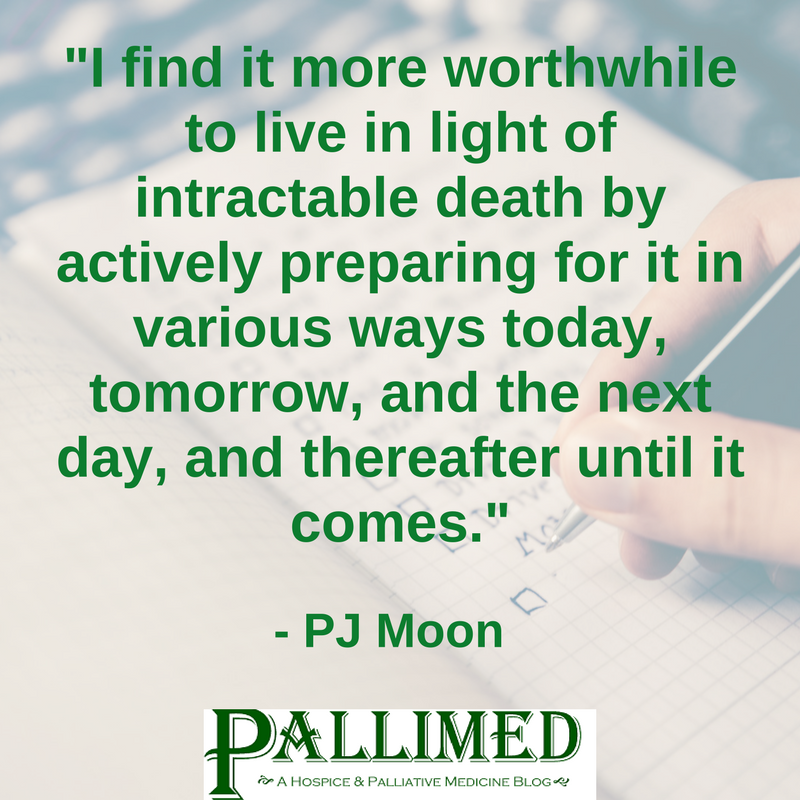 It will require that we prepare ourselves by facing our own mortality. We can and should be living and breathing versions of memento mori. We should not run and hide. Our death denying culture needs leaders to help our very sick and dying face the abyss. If not us, then who…?